Determine if anyone is injured. If you are involved in a crash, move your vehicle off of the road and stop, if possible. If anyone is injured, call 911 and provide appropriate help. You must report the crash to law enforcement if there is an injury, a death, and/or more than $1,000 in property damage (or more than $200 worth of damage made to non-vehicle government property, such as signs or guardrails). Red pavement marking or reflectors indicate a roadway that must not be entered. If you are driving and see red reflectors or pavement markings, turn around. When two vehicles enter an intersection from different highways at the same time, which vehicle must yield the right-of-way? 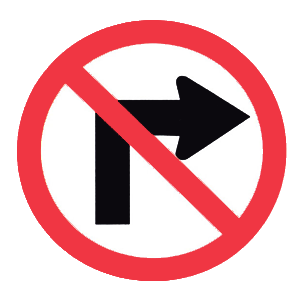 At intersections that are controlled by signs or signals and at intersections that are uncontrolled, the driver on the left must yield the right-of-way to the driver on the right when two vehicles arrive to the intersection at the same time. An acceptable response to bad drivers. Road rage is a criminal offense. If a minor traffic incident escalates into a far more serious situation, the drivers involved may face legal repercussions.